The Welsh Springer Spaniel was originated from the English springer/cocker speniel. Eventually, Renaissance hunters began to seperate the water spaniels from the land spaniels and by the late 1800s the Welsh speniel was a seperate breed from the other spaniels. Today the spaniels are still used as hunting dogs that find and spring at game. They also make good companion dogs if well trained. The Welsh Springer Speniel has been known as the Welsh Starter, Welsh Spaniel, Welsh Springer, and Welsh Cocker Speniel. 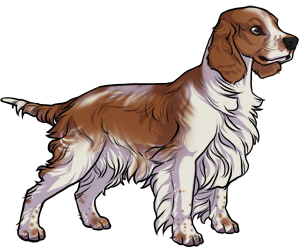 The AKC approved the Welsh Springer Spaniel in 1989. The Welsh Springer Spaniel began to become less popular around the World Wars and is still rare today.